An adaptive immune response is initiated in the T cell area of secondary lymphoid organs, where antigen-presenting dendritic cells may induce proliferation and differentiation in co-localized T cells after T cell receptor engagement. The chemokines CCL19 and CCL21 and their receptor CCR7 are essential in establishing dendritic cell and T cell recruitment and co-localization within this unique microenvironment. It is shown that systemic application of a fusion protein that consists of CCL19 fused to the Fc part of human IgG1 induces effects similar to the phenotype of CCR7−/− animals, like disturbed accumulation of T cells and dendritic cells in secondary lymphoid organs. CCL19-IgG further inhibited their co-localization, which resulted in a marked inhibition of antigen-specific T cell proliferation. 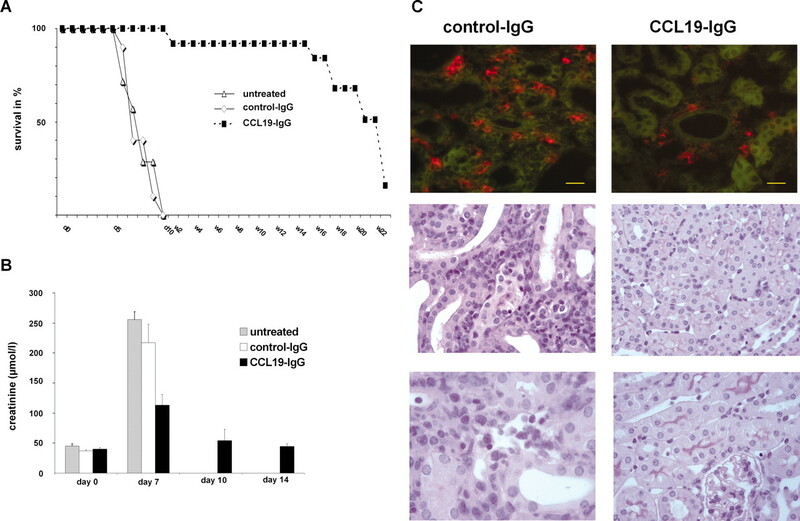 The immunosuppressive potency of CCL19-IgG was tested in vivo using murine models for TH1-mediated immune responses (delayed-type hypersensitivity) and for transplantation of different solid organs. In allogeneic kidney transplantation as well as heterotopic allogeneic heart transplantation in different strain combinations, allograft rejection was reduced and organ survival was significantly prolonged by treatment with CCL19-IgG compared with controls. This shows that in contrast to only limited prolongation of graft survival in CCR7 knockout models, the therapeutic application of a CCR7 ligand in a wild-type environment provides a benefit in terms of immunosuppression. Rapid initiation of a primary antigen-specific T cell immune response depends on the coordinated and efficient interaction between antigen-presenting dendritic cells (DC) and naive T cells. The chemokine receptor CCR7 and its homeostatic ligands CCL19 and CCL21 are pivotal for recirculation of both cell types into secondary lymphoid organs (SLO) (1). In particular, homing of CCR7-positive antigen-loaded mature DC into secondary lymphoid tissues occurs along a chemoattractant gradient of CCL19 or CCL21. DC that migrate within secondary lymphoid tissues spontaneously express CCL19 itself (2). Both chemokines also attract CCR7-positive naive and central memory T cells that support their co-localization with DC. Co-localized T cells encounter DC that are searching for a stimulating antigen within this specific microenvironment, the first step to initiate an immune response. In CCR7 gene–deficient mice (CCR7−/−) or in the ligand-deficient mice (plt−/−), the ability to initiate and generate a TH1/TH2 immune response, memory, or tolerance is severely limited (3–6). Targeting CCL19 or CCL21 might modulate immune responses in a clinically useful manner (7–9). 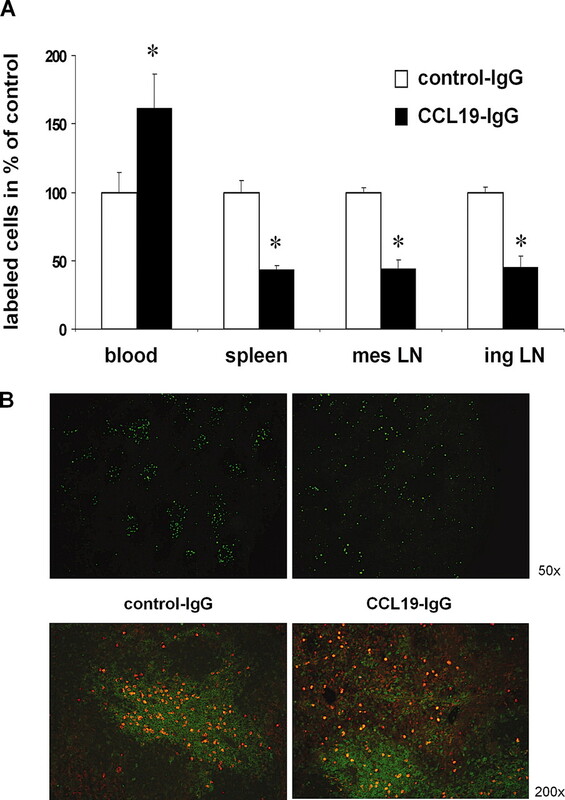 To extend the in vivo half-life of the chemokine, we fused CCL19 to the Fc part of IgG1 and tested whether this CCL19-IgG is applicable as a therapeutic tool to interfere with CCR7-mediated recirculation. We detected an immunosuppressive effect mediated by CCL19-IgG in different murine models, including delayed-type hypersensitivity (DTH) and two different models of allograft transplantation. In this study we show, that in contrast to only limited prolongation of graft survival in transplantation models that were performed in CCR7-deficient mice (10,11), application of CCL19-IgG was able to provide a marked prolongation of both kidney and heart graft survival. The mechanisms involved include disturbed homing of T cells and DC into SLO as well as disturbed co-localization and consequently an impaired response of T cell priming, so the alterations of immune cell trafficking that are induced by CCL19-IgG are similar to the effects described for CCR7 deficiency. However, the discrepancy between our approach and knockout models show that, when interfering with CCR7 in an intact environment, there might be additive effects to those induced by the genetic knockout. To our knowledge, this is the first study to demonstrate a clinically applicable tool to target CCR7-mediated cell trafficking for immunosuppression after solid-organ transplantation. The chimeric CCL19-IgG fusion protein was generated as described previously with minor modifications (12). For obtaining large amounts of the fusion protein, the CCL19-human IgG1 was expressed in suspension CHO cells that were adapted to grow under serum-free conditions (ProCHO4-CDM; Cambrex, Verviers, Belgium). The culture supernatant, which contained secreted CCL19-IgG1, was purified using Protein A Sepharose (Amersham Biosciences, Freiburg, Germany) (13) and stored at −20°C. The protein concentration was quantified by Bio-Rad Proteinassay (Munich, Germany), and serum concentrations in mice were measured by an ELISA capture assay as described previously (12). The biologic activity of CCL19-IgG1 was checked routinely in a chemotaxis assay (14). For all in vitro and in vivo experiments, equimolar ChromePure human IgG (Dianova, Hamburg, Germany) served as control for CCL19-IgG. The CHO cell line was obtained from ATCC (Manassas, VA). Cells were maintained in RPMI 1640 medium supplemented with 10% FCS, 2 mM l-glutamine, streptomycin (100 μg/ml), and penicillin (100 U/ml). For large-scale protein production and purification, the adherent transfected CHO cells were adapted to serum-free conditions and maintained in ProCHO4 media. Murine T lymphocytes were purified from spleen and lymph node (LN) suspensions of untreated mice. Purification was done using a MACS system after magnetic labeling of non-T cells (Pan-T cell antibody cocktail; Miltenyi, Bergisch Gladbach, Germany). Purity of >90% of T cells was confirmed by CD3 staining in FACS analysis. Male inbred C57BL/6 (H2b), female Balb/c (H2d), and ovalbumin TCR-transgenic DO11.10 mice were supplied by Charles River (Sulzfeld, Germany) and were housed at the animal facilities of Phenos GmbH, Hannover, University of Duisburg-Essen, or the University of Kiel under conventional conditions. Mice that weighed between 20 and 30 g and were 8 to 12 wk of age were used for all experiments. Mice were cared for in accordance with the institution’s guidelines for experimental animals. The animal protection committee of the local authorities approved all experiments. Preparation and culture of bone marrow (BM) cells to generate DC has been described (15). For complete DC maturation, 1 μg/ml LPS and 1 μg/ml PGE2 (Sigma-Aldrich, Taufkirchen, Germany) were added on day 10 for 24 h. For antigen-specific T cell priming experiments, BM-DC were pulsed with ovalbumin by incubation with 200 μg/ml ovalbumin, Grade VI (Sigma-Aldrich) before subcutaneous injection into footpads. Those ex vivo generated BM-DC (>90% CD11b+/CD11c+) were fluorescence-labeled by PKH26 or CFSE (Sigma-Aldrich) according to the manufacturer’s instructions. Thereafter, 1 × 106 cells were injected subcutaneously into the left footpad. DC recirculation was assessed after 48 h by dissection of lymphoid tissue of killed mice and by FACS analysis and immunohistochemistry. Furthermore, a model of contact sensitivity was used for recirculation studies. In brief, the abdominal skin of mice was shaved and painted with 100 μl of 0.5% FITC dissolved in dibutylphthalate/acetone. Labeled and matured cutaneous DC were counted after migration into secondary lymphoid tissues by FACS analysis of dissected regional LN (inguinal and axillary) 48 h later. Treatment consisted of daily intraperitoneal injections of 150 μg of CCL19-IgG or the same amount of control IgG throughout the experiments starting at least 6 h before application of cells or FITC painting. Each group consisted of at least five mice. The experiments were repeated at least twice. For recirculation studies, purified T cells (>95% CD3+) were fluorescence-labeled with PKH26 or CFSE according to the manufacturer’s instructions and injected into the mouse tail vein (2 × 107 T cells per mouse). Viability of >95% of cells was confirmed routinely by a trypan blue exclusion assay. After 6 h, mice were killed and the distribution of T cells was analyzed by determination of the fraction of labeled cells in blood, spleen, mesenteric LN, and inguinal LN using FACS analysis and cell count. Groups of five mice were either left untreated or treated by intraperitoneal injections of 150 μg of CCL19-IgG or the same amount of control IgG 3 to 6 h before cell transfer. For redistribution analyses, Balb/c mice were treated daily with 150 μg of CCL19-IgG or the same amount of control IgG. After 5 d, mice were killed and the cell numbers as well as the composition of the different lymphocyte subtypes within the spleens and LN were analyzed using FACS. Ovalbumin TCR-transgenic T cells from DO11.10 mice were isolated by magnetic labeling of non-T cells. A total of 107 transgenic T cells/ml suspended in RPMI 1640 medium were labeled by incubating with 5 μM CFSE (Sigma-Aldrich) and subsequent washing. Transfer experiments were performed by injecting 2 × 107 CFSE-labeled cells into the tail vein of normal Balb/c mice. Subsequently, 106 ovalbumin- or PBS-pulsed BM-DC were injected in a volume of 30 μl subcutaneously into either footpad of the mice. Concomitantly, treatment with CCL19-IgG or control IgG (150 μg intraperitoneally daily) was started. Mice were killed 72 h later, and draining popliteal LN were analyzed by FACS for proliferation of ovalbumin-specific T cells, which is indicated by the dilution of CFSE-fluorescence intensity. Spleens, peripheral (axillary, inguinal, and popliteal), and mesenteric LN were isolated from mice immediately after they were killed. These lymphoid tissues were embedded in Tissue-Tek (Miles Inc., Elkhart, IN), sectioned, mounted on glass slides, or frozen in liquid nitrogen and stored at −80°C until used. Sections (5 to 7 μm) were fixed in acetone; air-dried; rehydrated with PBS; and blocked with rat serum and stained with Cy3-, PE-, or FITC-conjugated antibodies against the indicated markers at 1:50 to 1:200 in blocking solution. After washing, the slides were mounted with Citifluor (Citifluor Products, The University, Canterbury, UK) and examined by immunofluorescence microscopy (Leitz DMRB). The relative distribution of transferred cells to red pulp, marginal zone, and white pulp was enumerated by image analysis of assembled micrographs. Female Balb/c mice were sensitized on day 1 by intravenous injection of 2 × 105 sheep red blood cells (SRBC). Mice were challenged 4 d after immunization by injection of 2 × 108 SRBC in 50 μl of PBS into the left hind footpad (specific swelling). For determination of unspecific swelling, an equal volume of PBS was injected into the right hind footpad. Results were the difference of swelling of both footpads, measured 24 and 48 h after challenge with a dial gauge caliper. The extent of immune response was quantified further by dissection and cell count of regional ipsilateral and contralateral LN. BALB/c mice received an intravenous injection of 6 × 106 PKH26-labeled CD4+ T cells. One day later, PBS, 150 μg of CD4+ T cell–depleting mAb GK1.5 (BD Biosciences, Heidelberg, Germany), 150 μg of control IgG, or 150 μg of CCL19-IgG was administered each in a total volume of 500 μl (n = 4 per group). Control IgG and CCL19-IgG injections were repeated (two doses of each 150 μg/d), and the efficiency of depletion was assessed after 7 d by isolation of spleen and LN cells and analyzing fluorescence-labeled cells by using flow cytometry. Vascularized kidney transplantation from C57BL/6 to Balb/c mice was performed as described previously (16). Briefly, mice were anesthetized with isoflurane, and the left donor kidney was attached to a cuff of the aorta and the renal vein with a small caval cuff, and the ureter was removed en block. After left nephrectomy of the recipient, the vascular cuffs were anastomosed to the recipient abdominal aorta and vena cava, respectively, below the level of the native renal vessels. The ureter was anastomosed directly into the bladder (17). Cold ischemia time was 90 min, and warm ischemia time was 30 min. The right native kidney was removed through flank incision 4 d later. Two experimental groups were evaluated. Mice were treated by intraperitoneal injection of two doses of 150 μg of CCL19-IgG versus 150 μg of control IgG per day. Treatment of the recipient was started the day before surgery and stopped after 3 wk. No other immunosuppressive treatment was administered. Mice that received a transplant were studied for renal function and survival. Serum creatinine levels were measured by an automated method (Beckman Analyzer, Krefeld, Germany). Kidney grafts were harvested 5 d after transplantation, and one half of each allograft was fixed immediately in buffered formalin and embedded in paraffin. Three-micrometer sections were stained with hematoxylin-eosin and periodic acid-Schiff stain and evaluated according to the updated Banff classification by a nephropathologist, who was masked to the experimental groups (18). For adoptive transfer experiments, 2 × 107 spleen cells from CCL19-IgG–treated kidney transplant recipients were isolated and purified 9 wk after surgery and transferred by intravenous injection into naive Balb/c mice (n = 6). Kidney transplantation was performed 3 d after the adoptive transfer, using the same donor strain (C57BL/6). No additional immunosuppressive treatment was administered. Recipient mice were monitored for renal function and survival. Vascularized heterotopic heart transplantation from C57BL/6 to Balb/c mice or vice versa was performed as described previously (19). General anesthesia was provided by injection of Ketanest (Ketamine; Pfizer Pharma, Karlsruhe, Germany) and Rompun (Xylazine; Bayer AG, Leverkusen, Germany). Two experimental groups were evaluated. Mice were treated by intraperitoneal injection of two doses of 150 μg of CCL19-IgG versus 150 μg of control IgG per day. Treatment of the recipients was started the day before surgery and stopped after 2 wk. No other immunosuppressive treatment was administered. Graft function was assessed daily by palpation. Rejection was defined as the lack of palpable cardiac contraction (20). Heart grafts were harvested 6 d after transplantation, embedded in paraffin, stained with hematoxylin-eosin, and evaluated by a pathologist, who was masked to the experimental groups. Level of alloantibodies was determined by flow cytometry as described previously (21) using sera that were obtained on days 6 and 20 after transplantation. The levels of donor-specific antibodies were expressed as mean fluorescence intensity. Data are shown as mean ± SEM or SD. Normal distribution was analyzed by the Kolmogorov-Smirnov test, and statistical significance was calculated by the t test for independent groups. SPSS 12.01 software was used (SPSS, Inc., Chicago, IL). For disruption of immune cell trafficking of CCR7-positive cells in vivo, prolonged high concentrations of CCR7 ligands were needed. By fusing CCL19 to the Fc part of IgG1, an extended systemic half-life of the chemokine was achieved, leading to trough level concentrations of 105 ± 19 μg of CCL19-IgG/ml after injection of two doses of 150 μg of CCL19-IgG per day per mouse, as determined by ELISA on day 3 after initiation of treatment. Accumulation of the fusion protein could not be observed, because concentration was in a similar range after 14 d of treatment. The chemotactic activity and binding avidity were identical to recombinant CCL19 as demonstrated previously (12). For assessment of the recirculation and homing of T cells, mice received 107 purified and fluorescence-labeled T cells intravenously 6 h before removal of LN. The cells were analyzed by FACS and microscopically. Figure 1A shows that the number of homed T cells was significantly reduced in mice that were treated with CCL19-IgG, compared with control IgG–treated mice. The findings were manifested in inguinal and mesenteric LN as well as in spleens with a homed T cell proportion of 43.2 ± 3.2, 44.1 ± 6.4, and 45 ± 8.2%, respectively (P < 0.05). In contrast, the proportion of labeled T cells in peripheral blood was significantly higher in CCL19-IgG–treated mice (161.2 ± 25.5% compared with controls; P < 0.05). No difference was noted between untreated and control IgG–treated mice. Moreover, migration of injected T cells into the T cell zones was significantly reduced in CCL19-IgG–treated mice. Figure 1B demonstrates the presence of labeled T cells restricted to the T cell areas only in control mice, but a random distribution throughout the spleen was noted in CCL19-IgG–treated mice. In summary, the systemic administration of CCL19-IgG effectively impairs homing of T cells into SLO quantitatively and qualitatively. CCL19-IgG impairs T lymphocyte homing into secondary lymphoid organs (SLO) and induces complex redistribution within lymphoid organs. A total of 1 × 107 fluorescence-labeled purified T cells were injected intravenously into mice that were treated with 150 μg of either control IgG or CCL19-IgG 2 h earlier. After 6 h, mice were dissected and the distribution of labeled cells was analyzed. (A) In CCL19-IgG–treated mice, T cells remain in blood and exhibit reduced entering into SLO. Relative distribution ± SD of labeled cells in CCL19-IgG–treated mice compared with control IgG group (set to 100%). Representative results from one of three experiments, n = 5 per group. *P < 0.05. (B) CCL19-IgG treatment disturbs specific homing into T cell areas in spleen. Histology of spleen sections: (Top) T cell areas are depicted by labeled T cells (green) in control mice, whereas random distribution is observed in CCL19-IgG spleens. (Bottom) Higher magnification displays the strict confinement of injected T cells (red) to T cell areas (green counterstaining with α-CD3-FITC) abrogated by CCL19-IgG treatment. Magnifications: ×50 in B, top; ×400 in B, bottom. Next, we examined the effect of CCL19-IgG on the migration of matured DC into draining LN using two different models. First, we applied FITC into the abdominal skin to induce contact hypersensitivity. After 36 h, the number of migrated DC, labeled by FITC-antigen uptake, was determined by FACS analysis of dissected regional LN. Figure 2A shows that after CCL19-IgG treatment, significantly fewer DC had undergone migration into draining LN (control IgG 3583 ± 264 DC versus CCL19-IgG 1778 ± 130 DC; P < 0.05). The total cell count in draining LN also was reduced in CCL19-IgG–treated mice, as illustrated in Figure 2B (untreated 14.7 ± 0.17 × 106 cells versus control IgG 15.2 ± 0.28 × 106 cells versus CCL19-IgG 5.2 ± 0.16 × 106 cells). In a second approach, ex vivo generated and matured BM-DC were injected subcutaneously into the footpads. The numbers of migrated cells were determined after 48 h, because preceding pilot experiments had shown that the DC count in the draining LN was maximal at this time point. The count of migrated DC was reduced in CCL19-IgG–treated mice, as seen in Figure 2C (control IgG 5550 ± 1410 versus CCL19-IgG 1268 ± 310 labeled DC in draining LN; P < 0.05) This was associated with a significantly reduced popliteal LN cell count, as demonstrated in Figure 2D (untreated 5.1 ± 1.0 × 105 cells versus control IgG 5.5 ± 1.4 × 105 cells versus CCL19-IgG 1.2 ± 0.3 × 105 cells; P < 0.05). In addition, Figure 2E shows that the spleen histology exhibited altered positioning of CD11c+ DC and T cells to each other. Thus, the major prerequisites for an adaptive immune response, recirculation and co-localization of T cells and DC, indeed are disturbed effectively by CCL19-IgG. 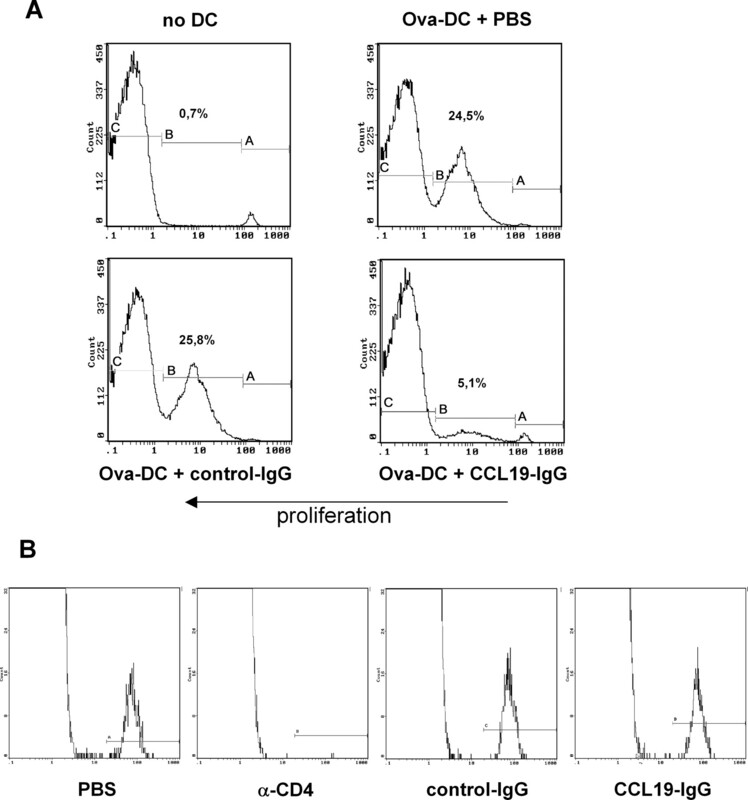 Influence of CCL19-IgG on migration of dendritic cells (DC). (A and B) DC recirculation after FITC painting is impaired by CCL19-IgG. Mice that were untreated or treated with either control IgG or CCL19-IgG were painted with 0.5% FITC in dibutylphthalate/acetone on the abdominal skin. Thirty-six hours later, draining lymph nodes (LN) were dissected and FITC+/CD11c+ DC were counted using FACS analysis. Number of FITC+/CD11c+ DC in draining LN (A) and total cell count of draining LN (B). (C and D) Recirculation of mature DC into draining LN after subcutaneous application is reduced by CCL19-IgG. A total of 1 × 106 ex vivo matured bone marrow DC (BM-DC) were fluorescence-labeled and injected subcutaneously into the left footpad. At the time of maximal DC count (after 48 h), popliteal LN were removed and analyzed for total cell count and labeled DC. Shown is the count of labeled DC in draining LN (C) and the total cell count of ipsilateral and contralateral popliteal LN (D). (E) CCL19-IgG interferes with distribution of CD11c+ DC around T cell areas in spleen. Sections of spleen immunohistochemically stained with α-CD11c-PE (red) and α-CD3-FITC (green). Magnification, ×100 in E.
We hypothesized that the potency of CCL19-IgG to impair the recirculation of immune cells results in immunosuppression. Therefore, we next analyzed the effects of the fusion protein in a model of TH1- mediated DTH. C57BL/6 mice were immunized and challenged with SRBC. Starting 2 h before immunization, mice were treated either with daily injections of 150 μg of CCL19-IgG or 150 μg of control IgG. As shown in Figure 3A, in mice that were treated with CCL19-IgG, footpad swelling was significantly diminished by 48% 2 d after SRBC challenge (control IgG 0.90 ± 0.07 mm versus CCL19-IgG 0.47 ± 0.06 mm; P < 0.05). Untreated and control IgG–treated mice did not differ significantly. Again, the cell counts of regional LN were significantly reduced in CCL19-IgG–treated mice. Figure 3B shows that the hypercellularity of the draining popliteal LN in the challenged foot was significantly less pronounced (control IgG 82 ± 10 versus CCL19-IgG 33 ± 6 × 105 cells; P < 0.01). These results confirm the notion that systemically administered CCL19-IgG is capable of suppressing immune responses in T cell–dependent models. Delayed-type hypersensitivity (DTH) is significantly decreased by CCL19-IgG. DTH was induced by intravenous immunization with sheep red blood cells (SRBC). After 4 d, mice were challenged by subcutaneous injection of SRBC into the left hind footpad; PBS was injected as control into the right footpad. Difference in swelling of footpads was measured on day 7; thereafter, draining LN were removed and total cells were counted. CCL19-IgG treatment results in significantly reduced swelling (A) and significantly reduced increase of the cell number in regional LN (B). Representative results (mean ± SD) from one of two experiments, n = 5 per group; *P < 0.05. To test whether the observed reduction of draining LN size is not only a result of redistribution but also a consequence of impaired priming of T cells, we analyzed the effect of CCL19-IgG on antigen-induced proliferation in vivo. We injected ovalbumin-pulsed DC subcutaneously into footpads concomitantly with initiation of intraperitoneal application of CCL19-IgG or control IgG for 3 d. The mice received an adoptive transfer of CFSE-labeled ovalbumin-specific T cells before DC injection. The success of antigen-specific priming was controlled using CFSE dilution in FACS analysis. Figure 4 demonstrates that in the draining LN of the control IgG–treated mice, a robust proliferation of ovalbumin-specific T cells occurred, whereas CCL19-IgG treatment resulted in a markedly reduced proliferation of ovalbumin-specific T cells in the draining LN. LN of the contralateral footpads served as controls. Here, DC “pulsed” with PBS instead of ovalbumin antigen were injected. CCL19-IgG functionally disturbs interaction between T cells and DC in vivo and does not deplete CCR7+ cells in vivo. (A) PKH-labeled ovalbumin TCR-transgenic T cells from DO11.10 mice were adoptively transferred into Balb/c mice. For monitoring antigen-specific T cell proliferation responses in vivo, ovalbumin-pulsed BM-DC were injected subcutaneously into footpads and compared with mice that received a transfer but were untreated (no DC). Concomitantly, administration of PBS, control IgG (2 × 150 μg/d intraperitoneally), or CCL19-IgG (2 × 150 μg/d intraperitoneally) was started. After 3 d, draining popliteal LN were analyzed by FACS for proliferation of ovalbumin-specific T cells (gated for lymphocytes). Graph shows analysis of pooled popliteal LN of five mice in each group, region A marks labeled nonproliferated cells, B marks proliferated cells, C marks unlabeled cells. (B) Balb/c mice received an injection of fluorescence-labeled CD4+ cells and treated with PBS, depleting α-CD4 mAb, control IgG, or CCL19-IgG. After 1 wk, depletion of labeled cells was analyzed by FACS in spleen and LN. Graph shows representative analysis of splenocytes; regions mark labeled cells. Cell depletion that was induced by CCL19-IgG could not be detected by in vitro analysis of either complement-dependent cytotoxicity or antibody-dependent cell-mediated cytotoxicity using murine effector cells (data not shown). In addition, we analyzed the cell counts of labeled T cells in mice with or without treatment of CCL19-IgG after transfer of CCR7+ ovalbumin-TCR transgenic T cells from DO11.10 mice into wild-type background. There was no significant difference in T cell recovery after 1 wk of treatment when compared with nontreated mice, clearly ruling out substantial depletion of CCR7+ cells in mice (Figure 4B). In summary, these results demonstrate that indeed the impaired T cell/DC interplay is of functional importance and prompted us to test the immunosuppressive potency of the fusion protein in clinically relevant models. First, we used a model of allogeneic kidney transplantation in mice that resulted in lethal renal failure as a result of graft rejection within 10 d (16). Figure 5A shows the survival of mice that received a transplant and were treated either with 150 μg/d CCL19-IgG or with 150 μg/d control IgG for 21 d. All recipients that were treated with control IgG died 5 to 9 d after surgery. In contrast, 90% of CCL19-IgG–treated recipients survived until weeks 15 to 20. Graft function as determined by serum creatinine concentration was preserved in the CCL19-IgG treatment group until week 9. The slight increase in creatinine concentration, shown in Figure 5B (creatinine on day 7: 113 ± 17 μmol/L), normalized in this group within 10 d. In contrast, graft function rapidly deteriorated in untreated or control IgG–treated mice (creatinine on day 7: 256 ± 26 μmol/L [untreated], 221 ± 31 μmol/L [control IgG]), which was accompanied by marked histomorphologic alterations. Five days after transplantation, the histologic analysis showed evidence of acute tubulointerstitial, cellular rejection with significant interstitial infiltrates and mild to moderate tubulitis (Banff borderline n = 6, grade IA n = 4) in all control IgG–treated mice as indicated in Figure 5C. In four mice, focal attachments of activated lymphocytes to swollen endothelial cells of medium-sized arteries (i.e., marginalization) were present; however, endothelialitis was not detected. All control IgG–treated mice exhibited marked diffuse acute tubular necrosis accompanied by dense tubular interstitial mononuclear infiltrates, as well as pericapillary inflammation. In contrast, the CCL19-IgG–treated group showed unremarkable cortical and medullar renal tissue with very limited interstitial cell infiltrates. Mild diffuse acute tubular necrosis was observed; however, tubulitis and pericapillary inflammation were not observed (all without rejection, Banff i0t0). Furthermore, 9 wk after surgery, the CCL19-IgG–treated allografts showed almost normal renal architecture without tubulitis or endothelialitis and displayed only focal perivascular mononuclear infiltrates (data not shown). However, the long-term survival without overt signs of renal insufficiency in CCL19-IgG–treated mice over 9 wk was not accompanied by induction of peripheral tolerance toward the grafted kidney. We adoptively transferred 2 × 107 splenocytes from transplanted, CCL19-IgG–treated mice 9 wk after transplantation into untreated Balb/c mice. Three days later, those mice underwent kidney transplantation under the same conditions without any additional treatment. The recipients died within 6 to 10 d after surgery as did control IgG–treated mice. Loss of renal function within 5 d after surgery was similar in treated and control IgG–treated mice. Thus, there was no evidence for a transferable tolerance in the CCL19-IgG–treated mice. Allograft kidney survival is dramatically prolonged by treatment with CCL19-IgG. (A) Survival of mice after allogeneic kidney transplantation. The graph shows the cumulative survival obtained from two independent experiments (untreated group n = 7, control IgG n = 13, CCL19-IgG n = 13 until week 9; at this time point, six mice were killed for adoptive transfer experiments and histologic analysis). (B) Renal function of the mice that received a transplant was monitored by serum creatinine. (C) Histologic analysis of allograft kidneys 5 d after transplantation. (Top) Immunohistology of frozen sections, red staining with α-CD4 PE-conjugated antibodies. (Middle and bottom) Kidney sections stained with periodic acid-Schiff. Sections of control group mice demonstrating tubulitis (middle) and capillaritis (bottom) versus sections of CCL19-IgG group demonstrating no signs of allograft rejection. Magnifications: ×400 in C, top and middle; ×600 in C, bottom. To exclude that the observed sustained allograft survival of kidneys is an issue of graft type, we tested the immunosuppressive effect in another transplant model. In a murine model of heterotopic fully vascularized heart transplantation, we could demonstrate again that treatment with CCL19-IgG induces significant longer survival of the grafted organs than in mice that were treated with control IgG or untreated (Figure 6A). The mean survival in the CCL19-IgG–treated group was 22 ± 2.9 versus 9 ± 0.75 d (SD) in the control IgG group (P < 0.05). The latter did not differ significantly from the heart survival in untreated mice (7.8 ± 0.83 d). To exclude that both the renal and the cardiac graft survival is a consequence only of a favorable mouse strain combination, we additionally performed the heart transplantation with reversed strain combination. Figure 6A (bottom) shows that CCL19-IgG also is effective under these conditions. Heterotopic allograft heart survival is significantly prolonged in CCL19-IgG–treated mice. (A) Graph shows cumulative survival of the grafted heart in independent experiments with eight mice in each group. Different mouse strain combinations were analyzed as indicated. CCL19-IgG–treated groups were significantly different from both other groups (P < 0001). 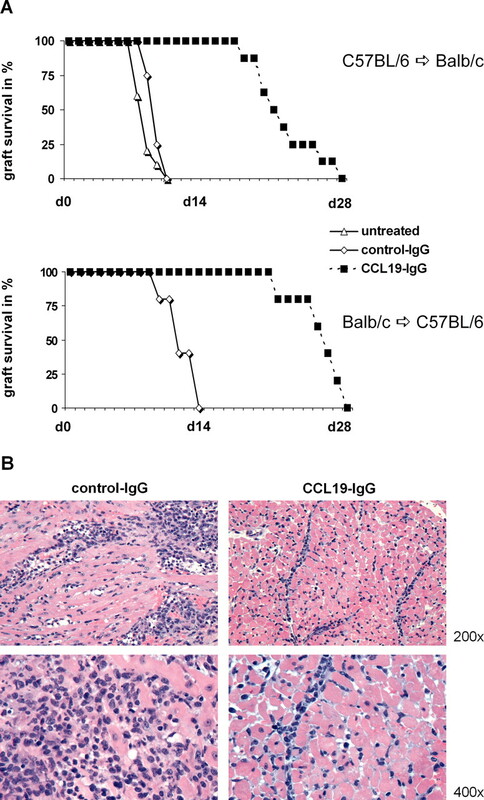 (B) Histologic analysis of cardiac allograft transplantation (C57BL/6 hearts were transplanted into Balb/c mice) 6 d after transplantation, demonstrating tissue-destructive infiltration of lymphocytes in control IgG group only. Light microscopic examination was performed after staining with hematoxylin-eosin, representative fields of ×200 and ×400 are illustrated. Consistently, grafts from mice that were treated with control IgG showed massive cellular infiltration with diffuse cardiomyocyte necrosis, whereas grafts from CCL19-IgG–treated mice showed capillary congestion and a mild scattered infiltration with mononuclear cells of the cardiac muscle tissue. The integrity of cardiomyocytes was preserved (Figure 6C). Furthermore, the analysis of level of alloantibodies did not show significant differences between groups. At day 6, alloantibodies of IgG type were not detectable, whereas at day 20 after transplantation, all groups exhibited comparable levels of donor-specific antibodies as determined by FACS analysis (mean fluorescence intensity 12.5 ± 0.4 [untreated] versus 8.9 ± 0.3 [control-IgG] versus 9.1 ± 0.4 [CCL19-IgG]). Initiation of an immune response depends on recirculation of lymphocytes and DC, as well as their co-localization within SLO (22–24). Studies in gene-targeted mice that are unable to express either the chemokine receptor CCR7 or their ligands CCL19 and CCL21 have shown that these molecules play pivotal and nonredundant roles in this complex process. Those mice are unable to launch an appropriate immune response (3,23,25,26). However, therapeutic targeting of CCR7 for immunosuppressive purposes was not yet feasible because appropriate tools were lacking. We demonstrated the immunosuppressive potency of a CCR7-binding CCL19-IgG fusion protein. The agonist fusion protein CCL19-IgG, when given for only a few days, induced similar effects on T cell and DC migration that are known from CCR7−/− mice (3). Explanations might be, first, under both conditions (CCL19-IgG treatment as well as CCR7 deficiency), T cell entry into SLO is hindered and the cells remain in circulation (3). Second, DC migration into draining LN is reduced (27,28). Third, cellular congestion in draining LN is markedly suppressed (29). Finally, compartmental migration and co-localization of CD11c+ DC and CD3+ T cells within the spleen is disturbed and accordingly the distribution of lymphocytes in different SLO is altered (3). How can an agonistic chemokine fusion protein induce similar effects as those observed by deleting the corresponding receptor? Cells that recognize certain locally expressed chemokines migrate along a concentration gradient. This gradient is disturbed by application of high chemokine dosages that subsequently will be distributed throughout the body. This principle was used effectively earlier in different models for various cytokines (13,30–34) and was transferred recently into a clinical trial (35). The prolongation of the serum half-life from minutes to 24 h by fusing the native CCL19 to the Fc part of IgG certainly is a prerequisite to provide this effect. Moreover, receptor desensitization and downregulation have to be taken into account, for CCR7, in particular. 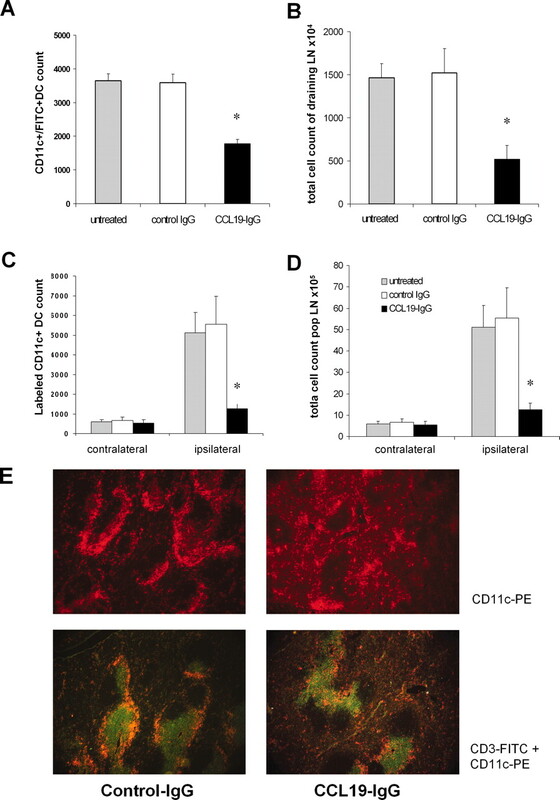 For sustained concentrations of CCL19 that exceed 1 μM, an impairment of extravasation as a result of lack of integrin activation could be due to desensitization (36,37). We assume that this mechanism contributes to our findings, because serum concentrations in CCL19-IgG–treated mice exceeded this level of 1 μM. Receptor downregulation could be even more important in light of very recent observations made by Marsland et al. (38) as well as Kursar et al. (39). Marsland et al. (38) could identify CCL19 and CCL21 as potent adjuvants for activating capacities of DC. Kursar et al. (39) could show that priming of subsets of CD8+ T cells also requires CCR7. Both pointed out the importance of the co-stimulatory function to build up an cellular immune response. This is not in contrast to our observations, because CCL19 induces rapid downregulation of CCR7 (40); therefore, an important co-stimulatory molecule would be missing in repeated stimulation. In fact, we also could demonstrate downregulation of CCR7 by CCL19-IgG (12). After 1 d of CCL19-IgG treatment, substantial downregulation was present also in vivo (data not shown). Although the co-stimulatory properties of CCR7 in general and the influence of CCL19-IgG as well still remain to be analyzed further, it is intriguing that downregulation of this receptor contributes to the observed immunosuppression by deprivation of activating signals. Taken together with the profound alteration of cell trafficking behavior, the net effect of CCL19-IgG is a reduced clonal T cell response as demonstrated in the model for DC-mediated antigen-specific T cell priming (Figure 4A). A drastically reduced proliferation of antigen-specific T cells results from treatment with CCL19-IgG. Therefore, a central part of the adaptive immune system is critically impaired by this fusion protein. Consistent with the mechanisms discussed above, in the T cell–dependent DTH model, the CCL19-IgG–induced decrease of the immune response was associated with a markedly reduced lymphocytic accumulation in LN. However, because a tool for therapeutic targeting of CCR7 is missing, a relevant question was whether CCL19-IgG also would be able to interfere with alloreaction in solid-organ transplantation. First, we assessed this in a model of allogeneic kidney transplantation, which was adapted to a lethal outcome unless the mice were treated. Indeed, untreated as well as control-IgG–treated mice died within 10 d as a result of rapid, histologically proven allograft rejection that resulted in kidney graft failure and uremia (17). Three weeks of treatment with the CCL19-IgG fusion protein improved survival to 90% at 15 wk. The renal histology confirmed a nearly absent immunologic response at day 5, compared with the acute cellular rejection in control-IgG–treated mice. This beneficial effect was substantiated by equivocal results after heart transplantation. Although CCL19-IgG could not induce a graft survival as long as in the kidney model, it resulted in significant prolongation compared with untreated and control-IgG–treated mice. These results in two different transplant models clearly point out that the favorable survival of the grafts indeed is a specific effect of CCL19 fusion protein as a result of the observed changes in T cell homeostasis. Thereby, as previously shown for this model (41), we confirm that the effects on T cell responses are sufficient to provide a prolongation of survival, because results from analysis of donor-specific antibodies show that B cell–mediated alloresponses were not impaired by CCL19-IgG. Although it is known that the survival of different solid organs varies substantially depending on organ type (42), the longer survival of kidney over heart grafts might indicate a further specific effect mediated by CCL19-IgG. Because one important difference in the two models is the longer ischemia time in the kidney model, it well could be that CCL19-IgG additively effects ischemia-reperfusion injury. It could be demonstrated that reperfusion injury is critically dependent on T cells and their adhesion on epithelial cells (43). As discussed above, this adhesion could be reduced by missing co-stimulation as a result of CCL19-IgG–mediated downregulation of CCR7. Supporting this thesis, histology of the kidney grafts of CCL19-IgG–treated mice showed indeed less pronounced acute tubular necrosis. Whether CCL19-IgG is able to suppress ischemia-reperfusion injury is being investigated in further studies. In previous literature, the effect of targeting CCR7 or its ligands on solid-organ transplantation was assessed only in knockout models, but these studies demonstrated only limited prolongation of organ survival in the CCR7−/− as well as plt−/− groups compared with wild-type mice (10,11,44,45). In contrast, the graft survival in CCL19-IgG–treated mice was superior to that reported for transplants in knockout mice in both models. Even in the same model (heterotopic, fully MHC-mismatched, vascularized heart transplantation), there is a marked better survival in CCL19-IgG–treated mice than if hearts were grafted into CCR7 knockout mice (10). These different results seem to be conflicting, but, first, there are more examples published of differences between a permanent genetic knockout and a time-limited therapeutic blocking approach in an immune-competent host, and, second, the agonistic fusion protein potentially could activate pathways that result in the observed effects. A well-known example for difference between knockout and therapy are animals that are deficient for IL-2 and display an exaggerated immune response that results in an autoimmune phenotype (46). In contrast, the widely used immunosuppressive calcineurin inhibitors interfere with transcription of the IL-2 gene to suppress the immune response. Similarly IL-2 receptor antagonists provide additional immunosuppression in transplant settings (47,48). Another example is the block of IFN-γ, which leads on the one hand to susceptibility to autoimmunity in the genetic knockout (49) and on the other hand to immunosuppression as a result of inhibition of the action in a, immunocompetent genetic sufficient host if blocking antibodies are used therapeutically (50). Therefore, for immunocompetent hosts, conclusions cannot be drawn easily from knockout models, and, as we could demonstrate earlier for an IL-2 fusion protein (13), there can be considerable differences between agonistic blockers of a cytokine and the phenotype of a mouse that is deficient for the same cytokine. It is not understood in detail which pathways of signal transduction are activated by CCR7, and it is not analyzed, yet, whether those pathways are rescued by signaling of other receptors in CCR7-deficient mice. Given that CCR7 is co-stimulatory on T cell proliferation and TH1 polarization (51), however, a timely limited block of CCR7 could interfere with T cell co-stimulation. This influence could not be present in the knockout model because of escape mechanisms and might contribute to prolongation of graft survival that was observed in the therapeutic approach only. Our data show that, in terms of immunosuppression, therapeutic targeting of CCR7 is effective and made possible by a CCL19-IgG fusion protein that provides a tool to achieve disruption of cell trafficking in a clinical setting. This fusion protein affects key steps of initiating an immune response, namely appropriate recirculation of DC and T cells and co-localization of both cell types within SLO. As a consequence, antigen-specific T cell proliferation is impaired. We demonstrated the immunosuppressive potency of systemic high-dosage application of CCL19-IgG by improved survival in allogeneic solid-organ transplantation, superior to survival in transplantation models with mice that are deficient for either CCR7 or its ligands, so further analyses of the potency of therapeutic interference with the CCR7 system should be warranted. We thank Mareike Newsky, Jeun-Koon Park, and Herle Chlebusch for expert technical assistance. We also thank Jaba Gamrekelashvili and Tim Greten for performing adoptive transfer experiments. E.Z. and F.G. contributed equally to this work.